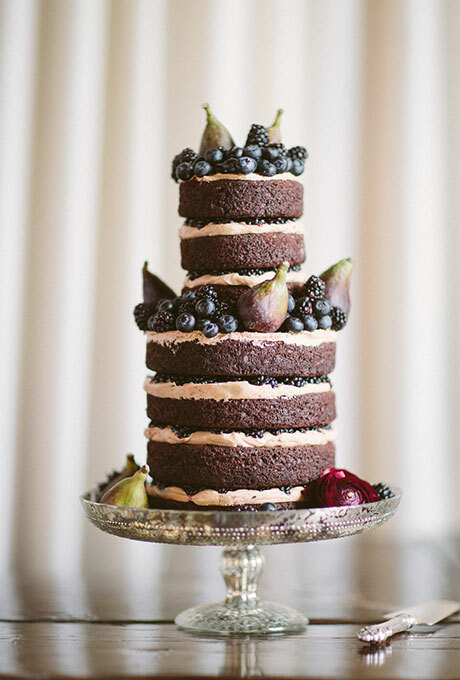 This naked chocolate cake is the perfect “undressed” cake for a fall wedding thanks to the espresso frosting and the fresh berries and figs that adorn the cake. There is no way your guests won’t love this cake! I am in love with the dark, dramatic hues of this cake created by the dark blueberries and deep purple blackberries. It really makes for an elegant cake. You’ll find this naked chocolate cake here. It was created by Lael Cakes.